I knew I wanted to make a bean soup this week but the type of soup would be decided by the beans we chose to go in it. We went through all the new varieties of beans we had picked up from Rancho Gordo in San Francisco & decided on the Sangre de Toro beans. According to the Rancho Gordo website these beans are great for red beans & rice so I went with that idea for the soup. I spiced the soup up a bit by adding some guajillo peppers & some smokey serrano hot sauce. (Matt tried the Boulder Hot Sauce Company hot sauce at Birchwood Cafe the other morning & liked it so much he bought two varieties from them on line.) I don't think I've ever seen Matt like a soup as much as he did this one. The broth came out just amazing & full of flavor. And these beans! Oh, these beans! They were just perfect in the soup, they're tender but they didn't get mushy or lose their shape. They had a wonderful mouth-feel. The bread with paired this with is the Olive Spelt Bread from Healthy Bread in Five Minutes a Day . Matt had had some olive bread at One Market while in San Francisco last week & loved it so he suggested that. I was going to just add olive to a loaf of bread when I saw Zoe & Jeff already had an Olive Bread in their book. They say it is one of their favorites so we figured go with that. The bread was really good with a great crumb but we think we needed a saltier olive to really stand out. By the way, thanks to this book we're in love with spelt flour. Put the beans in a pot with about 3 cups of water. Bring to a boil & let boil for 2 minutes. Remove from heat, cover & let sit 1 1/2 to 2 hours. Drain. Cut off the stems & seed the guajillo chiles. Put them in a bowl & pour 1 cup of boiling water over the top. Let sit 15 minutes or until soft. Chop the chiles reserving the soaking water. In a large soup pot cook the bacon over medium-high heat until just beginning to get crispy & rendering its fat. Add the onions & garlic. Cook until softened & the onions are turning translucent. Add the thyme, oregano and chopped guajillos. Stir. Add the chicken broth, water. tomatoes, ham shank, salt, pepper, hot sauce & reserved soaking water. Stir, crushing the tomatoes a bit with your spoon. Add the beans. Bring to a boil. Cover, reduce heat & simmer for 2 1/2 hours. Bring back to a boil & add rice. Stir, cover, reduce heat to simmer. Cook for 30 more minutes until rice is tender. If the soup is too thick add more water (we actually added another 2 cups before storing the leftovers & it didn't effect the flavor at all). I also love your choice of bread. I want those beans! Are guajillo chiles very spicy? I'm still learning about all the different kinds and trying to work my way up the heat scale. The weather has been rather mild lately but I can see myself diving into this the moment the thermometer drops. That soup looks fantastic! i think Mike would really enjoy it too... and the bread you paired with it looks really tasty too! 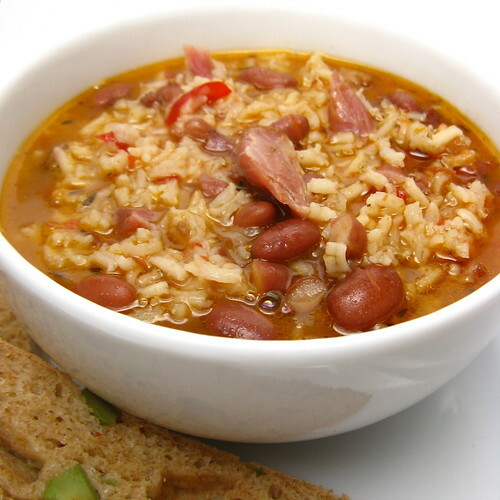 smoky, spicy, beany, brothy--this has all the makings of a killer soup. looks delicious! This soup sounds like something my Hubby would love. Bookmarked! i need to get my healthy in 5 book. i was waiting to get it at a local bookstore. the whole dinner looks heavenly. That is an excellent pairing. Its funny you keep choosing the breads that I am about to make from that book. I am going to be doing a review of that book for Bloggeraid. I absolutely love it and feel like I want to make every bread in there. SO far the two that I tried were sensational. I've been freezing today, so this would be perfect! Oh that looks incredible. 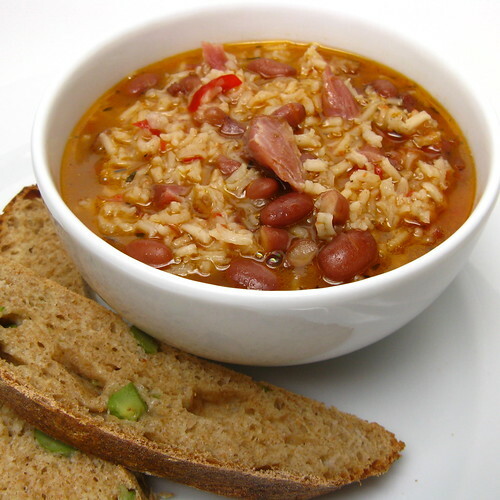 I love red beans and rice, the smokiness... sounds like it would translate perfectly to soup. I'll have to give this a try if I can find the chiles. Keener - Good catch! The beans go in right after the tomatoes. I've fixed it in the recipe. This is delicious! And I didn't even have the ham hock to add (or certain other ingredients which I had to substitute). Thanks for a great recipe!